Weddings are one of the most exciting events, especially for girls. They put too much effort so everything can look and feel perfect. When planning a wedding, most of the girls know what they want. They already have an idea about their wedding dress and how the entire ceremony should look like. When organizing a wedding, the first step is deciding on a theme. Making a wedding does not need to cost you a fortune. Today, modern weddings are all about making savings. For example, a rustic look is a cost-friendly option and when done well it provides a beautifully simplistic look. When speaking of rustic or vintage wedding decoration, we cannot go further without mention the gorgeous bird cages. Wedding bird cage looks amazing while is practical and pretty at the same time. It is a decorating item that can be used in several different ways including displaying a table plan, storing wedding cards or use it as a centrepiece filling it with flowers or candles. If you decide to include wedding birdcage in your wedding decoration plan, we offer you few more ideas how to include birdcages at your wedding and make it look simple but perfect. When all your wedding décor is vintage then you as a bride should fit into the entire atmosphere. This means your bridal look should also need to be vintage inspired. Do not forget the bridal accessory. Choose a birdcage wedding veil to complete your look. For people to know you are getting married, they need to receive invitations. Use them as a messenger of what is about to come. Let your guest know that they will be part of a vintage ceremony full of flowers and birdcage motif. The cake is important as any other thing included in the wedding. Once you choose a rustic theme and include bird case in the décor you can consider of a cake designed to look like one. They look amazing and will fit perfectly in the entire ambient and décor of the table. You can also consider cupcakes as an addition to your wedding cake. Go for some with a floral design so you can be sure they will fit just perfect. You should keep safe all the cards you will receive on your wedding day. This means you need to have a case where to store them and keep them out of the way. 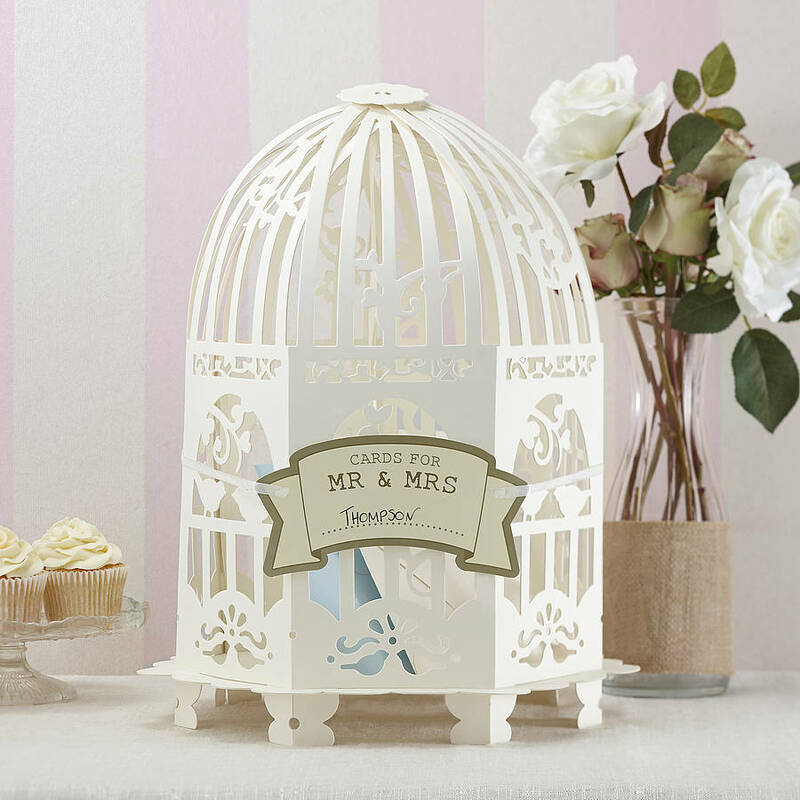 You can choose a birdcage shaped box and personalized it with your names. Once the ceremony comes to an end, you can always have this card box as a reminder of your wedding day. Make sure you keep it simple and not overdo with decoration details. Sometimes the less is better.